Copyright 2011 Nova Science Publishers, Inc.
Learning medicine in rural contexts is widely considered to be a positive strategy for the longer term recruitment of doctors to rural practice. The Rural Communities Program (Rep) is a week-long placement of a small group of students in a small rural community that is serviced by a Community Health Centre, resident General Practitioner (GP) or visiting GP. 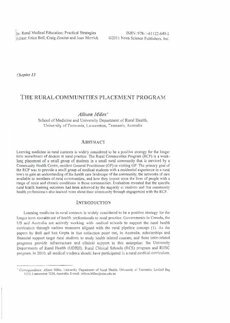 The primary goal of the Rep was to provide a small group of medical students with a residential experience in a rural town to gain an understanding of the health care landscape of the community, the networks of care available to members of rural communities, and how they impact upon the lives of people with a range of acute and chronic conditions in those communities. Evaluation revealed that the specific rural health learning outcomes had been achieved by the majority of students and that community health professionals also learned more about their community through engagement with the RCP.